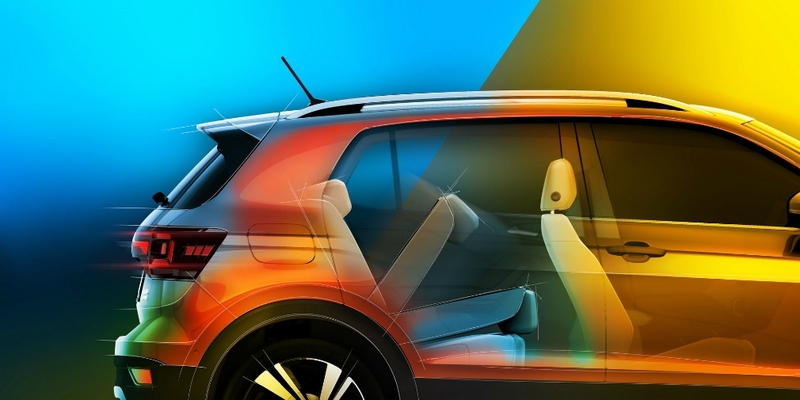 Volkswagen showed new teasers and at the same time told about some details about the new compact crossover T-Cross. The debut of the car will be held this fall in Paris, and on the shelves, the novelty is expected next spring. The car is made on the improved modular base MQB, allowing the axle to be pushed forward axially ahead. Due to this, the free space in the car increased and the luggage compartment volume increased - 455 liters. The company says that such a figure in this segment is the maximum! Folding the rear row, the volume grows to 1281 liters. Preliminary information states that the engine compartment of the car will include 3-cylinder supercharged engines 1.0 liters per 95 and 110 "horses". Among transmissions, there is a 6-speed MCP or RCP for 2 clutches. Still expected 150-horsepower 1.5-liter turbocharged V4, plus 2 diesel 1.6-liter engines for 95 and 115 hp.